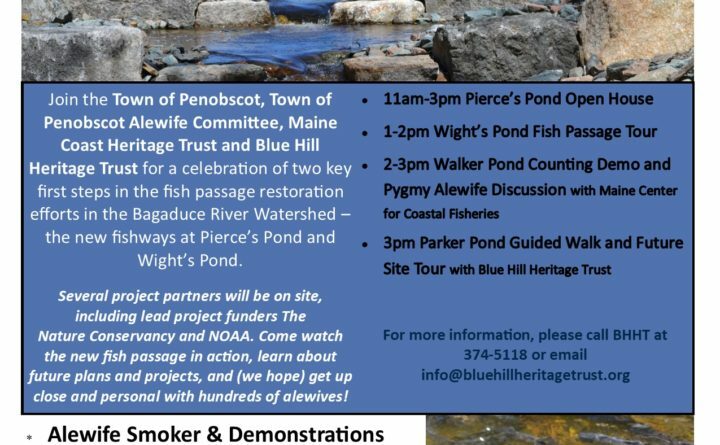 PENOBSCOT — Come to the town landing 11 a.m.-3 p.m. Saturday, June 2, at Pierce’s Pond in Penobscot and join the town of Penobscot Alewife Committee, Maine Coast Heritage Trust and Blue Hill Heritage Trust for a celebration of two key first steps in the fish passage restoration efforts in the Bagaduce River Watershed — the new fishways at Pierce’s Pond and Wight’s Pond. Several project partners will be on site, including lead project funders The Nature Conservancy and NOAA. Come watch the new fish passage in action, learn about future plans and projects, and (we hope) get up close and personal with hundreds of alewives. We’ll have lots of free food and daring visitors can try a smoked alewife. There will be alewife smoker on site with Downeast Salmon Federation. There will be fun activities for all ages. Plus, visitors will get a free Bagaduce Alewife bumper sticker. There will be other events happening that afternoon in the region to showcase other fish passageway happenings in the watershed, both completed and in the works. For information, call BHHT at 374-5118 or email info@bluehillheritagetrust.org .